.xyz is for every website, everywhere. We really mean that. XYZ, now and in the future, will always protect people’s rights and will not relinquish that to the Chinese government or any other government for that matter. To be 100% clear, XYZ is an organization that strongly supports freedom of speech, privacy, and anti-censorship for all internet users. In fact, we ran an awareness campaign and made donations to the Electronic Frontier Foundation last November to protect freedom of speech. We have also been a vocal supporter of privacy protection for your domains and net neutrality. Starting this weekend, there have been a number of articles published with inaccurate information regarding our upcoming accreditation in China. Speculation exists that there is some kind of banned list being driven by the Chinese government. This is not true. There is no banned list. There are no restrictions to registering a .xyz domain, with the exception of Specification 5 of the Registry Agreement, which all new domain extensions are bound to. The Wall Street Journal even went as far as to claim that domains like liberty.xyz and statueofliberty.xyz are being blocked due to a “deal” that I made with the Chinese government. This is completely untrue. By doing a basic WHOIS lookup or visiting the websites, anyone can easily see that both of these domains are actually registered and live on the internet. This speculation began when a few lines of technical documentation filed with ICANN were misinterpreted. To clear the air, this technical document addressed the proactive abuse mitigation we will take to shut down phishing, pharming, malware, and other abuse in China. This is consistent with how we currently suspend abusive domains everywhere else in the world. So it is worth repeating again — THERE IS NO BANNED LIST. No deal whatsoever has been, or will be, made by XYZ with the Chinese government or any other government to compromise free speech. 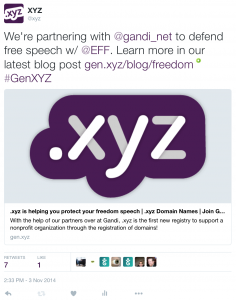 Nothing on any existing .xyz domain or future .xyz domain will be censored by the registry. Becoming accredited in China means that .xyz will soon be one of the first new non-China-based domain extension that can actually be used by Chinese citizens to have a web presence (more information to come). This is a significant milestone for XYZ and me personally, since our mission has always been to bring the next generation of internet users online. I challenge anyone reading or questioning this to go to their registrar and search for any .xyz domain. If it is available, register it — because you have the freedom to use it.